In the 21st issue of Taste Magazine I asked the team to please give me a recipe for tortilla wraps. This was way back in April 2007 and since then I have done nothing about the recipe for flour tortillas other than file it for later use. Since then I have continued to buy my wraps from Woolworths, and they are not cheap. Mine may not have been as perfect, but they are great and I am now left wondering why on earth I waited so long to make them. They are so easy and all you need to do is make them about an hour before you want to use them. They need to rest for 30 minutes and so you can go from ingredients to a meal in an hour. I made 4 to see how they would work and the recipe I have given below is for 4 wraps. You can increase the recipe to suit you, as they have be frozen for up to 3 months or left in the fridge for 5 days, once cooled. As they are so easy to make I decided it would be just as easy to make them when I need them. I did not use my tortilla to make a wrap. Instead I decided to serve it with a cold soup. Everything is in grams. How about cups and ounces, for us Americans that lack the metric expertise the rest of the world has. Thank you. Woof. Oh Tandy thank you sdo much – this is brilliant for me as although we can get them here they are hideously expensive and always seem to be close to their “sell by” date and have a strange taste. Making them will be cheaper and tastier and quicker than driving a 100km round trip (not that I´d do that just to buy a packet of tortillas)! I’ve never thought to make my own tortilla and now I see how easy it is!! I can only imagine how much better and fresh tasting they are too!! Oi! I’m going to become a huge fan! I just love cooking and for the first time ever tried my hand to different stuff like making pickled onions and fresh Chillies with Garlic and ginger for future use. On my list of new things to try! Hi Tandy, wonderful recipe, and now that you can roll the wraps i am sure you would like to try your hand at some wholewheat rotis. Enjoy your weekend. This is a great recipe Tandy! 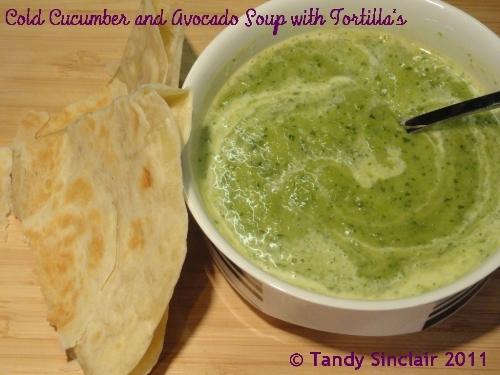 The soup sounds really refreshing…must make some when the weather gets warmer. The homemade flour tortillas look awesome! Tandy, that’s very clever of you, lovely thin tortillas. I’d always assumed you’d need a tortilla press to get them so thin! I always have these in the freezer so rarely make wraps but I love the sense of achievement when I do. Your recipe sounds nice and easy so I will try and stop myself being so lazy next time! The soup looks very inviting, and I too have just started out making wraps, pitta etc and like you I don’t know why it took me so long to get round to them! Pita is also on my list! I made wraps this morning for Himself and the Troll (who calls in each day to pick up her sarmies!) I agree they are a breeze to make. My recipe calls for oil rather than butter. Hi Tandy, do you have an adaptation that’s wheat free? E.g. rye flour? Or even whole wheat? I know the content and weight of the flour can change things dramatically and I can never find a workable recipe! Cake flour? Is that a mix of different grades of flour, or is it what we’d call plain flour in the UK? I’d love to try these! I”m mad for flatbreads of any kind – nice recipe. now this is one I think I can try! this might be a silly question, but did you use cake flour?